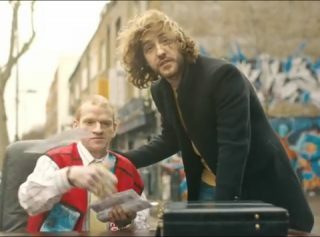 Comedian Seann Walsh stars in The Big Issue’s mythbusting new video alongside vendors, in a bid to get customer to always #TakeTheBigIssue. 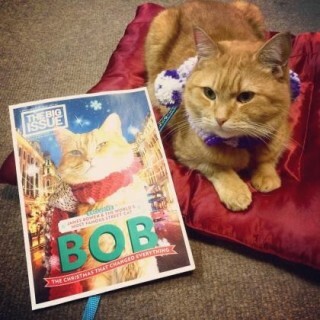 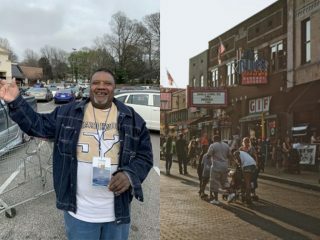 Check out the new trailer for the Street Cat Bob film – which tells the story of Big Issue vendor James Bowen and his high-fiving ginger cat. 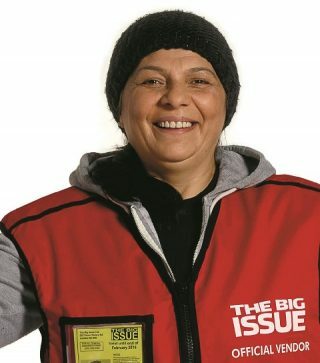 “I am very proud,” says Floriana Stanciu as she is picked as one of the faces of the airport’s ‘Welcome’ poster campaign. 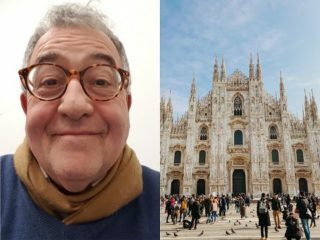 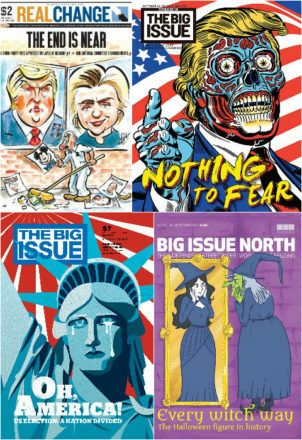 Big Issue editor Paul McNamee: on to the next 200 million! 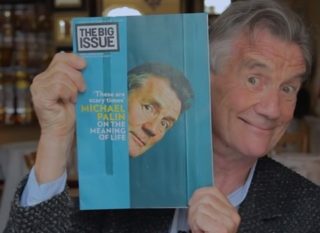 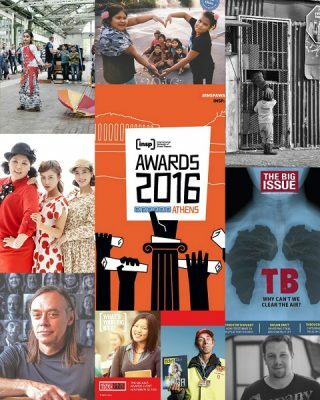 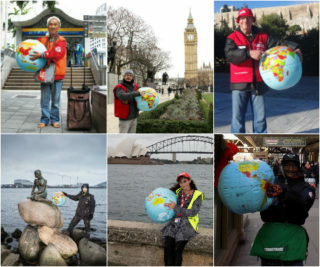 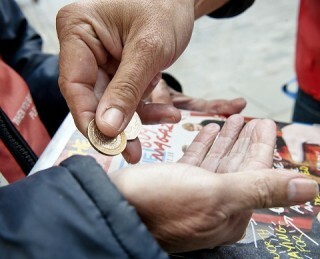 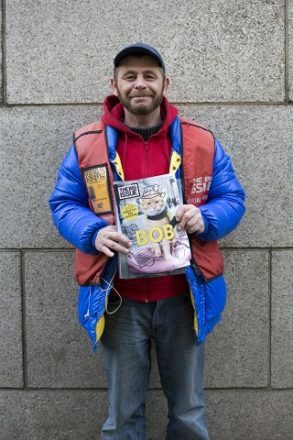 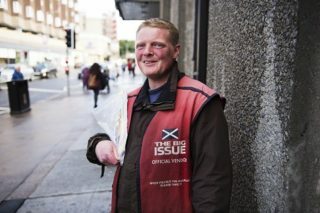 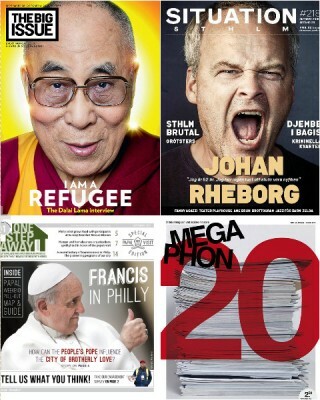 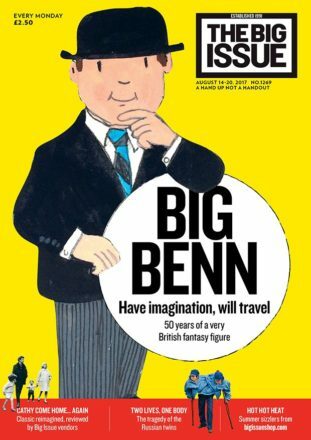 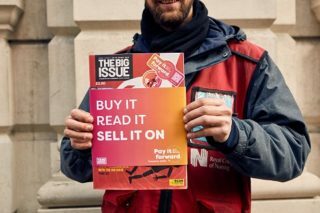 Today, The Big Issue marks 200 million copies sold in the UK. 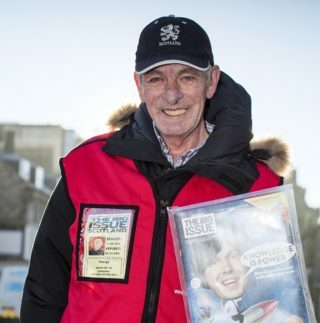 Big Issue editor Paul McNamee says that vendors are at the heart of the celebration. 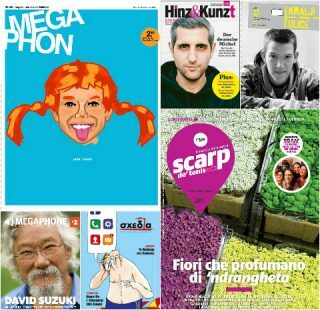 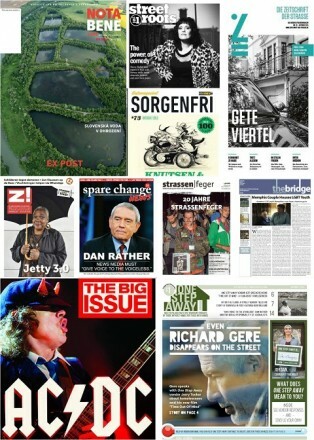 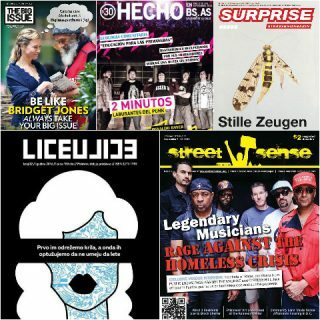 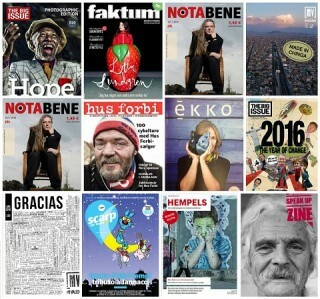 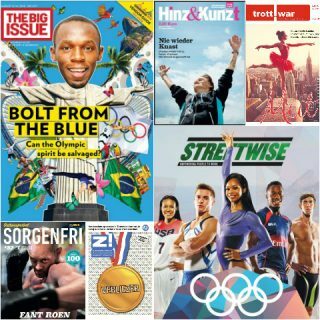 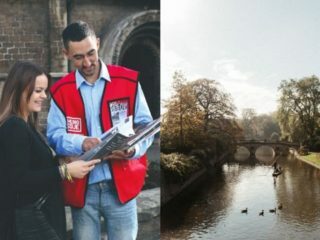 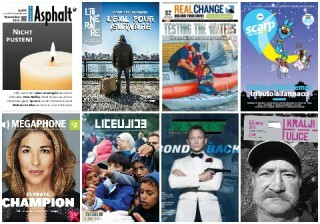 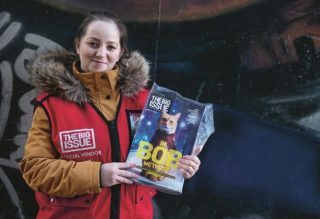 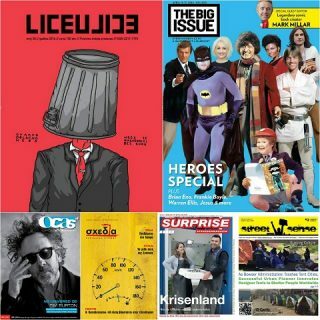 This April, The Big Issue UK celebrates 200 million magazines sold across Britain over the last 25 years – every one of them putting money in the pocket of someone living in homelessness or poverty. 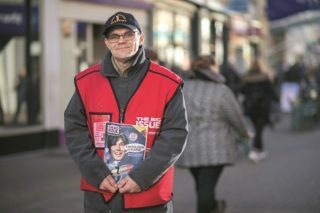 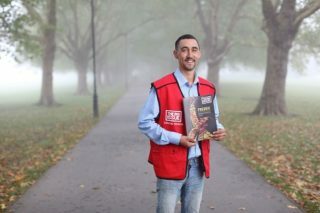 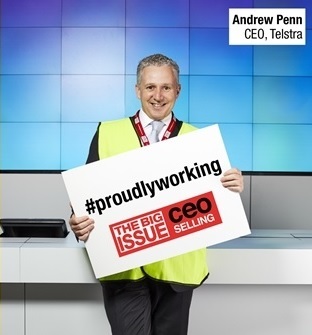 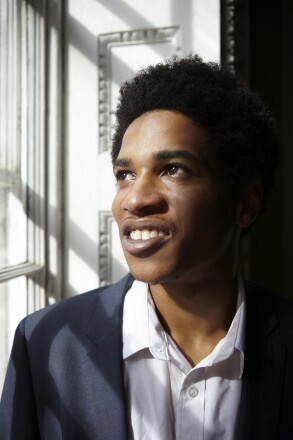 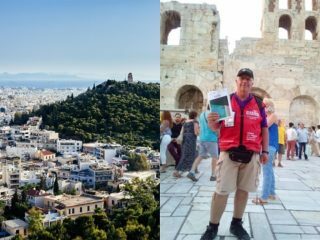 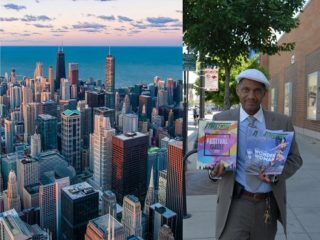 Ex-Big Issue vendor Joel Hodgson went from sleeping rough in London to working for one of the city’s top law firms, thanks to The Big Issue Foundation. 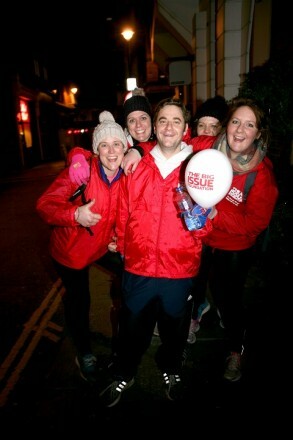 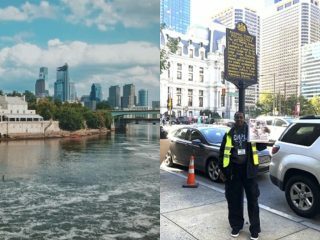 He shares his inspirational story and explains why he’s supporting The Big London Night Walk tomorrow. 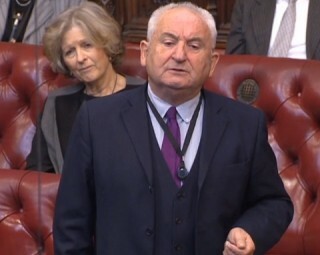 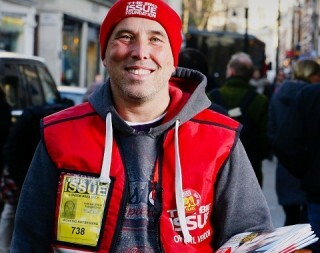 The Big Issue founder John Bird today spoke of his decades of fighting poverty through street papers in his maiden speech to the House of Lords. 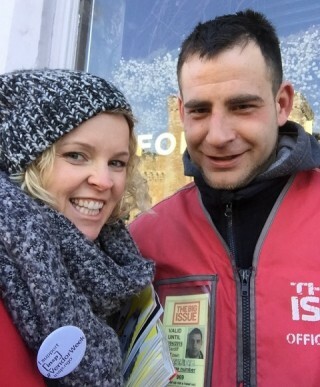 Georgina Jones, Founder of Turn Lights On sold The Big Issue for #VendorWeek. 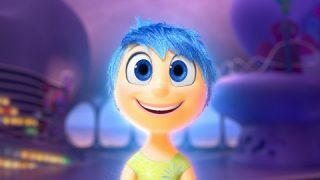 This tearful video tells her story. 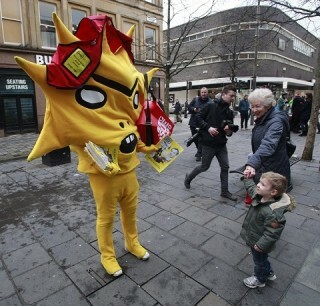 #VendorWeek: Would you buy a Big Issue from this seven-foot angry sun? 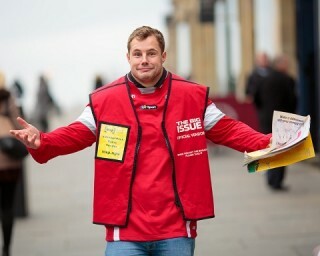 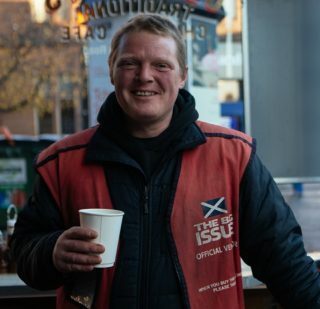 David Shrigley-designed Partick Thistle mascot Kingsley and Belle and Sebastian’s Stuart Murdoch led a team of guest vendors selling The Big Issue for INSP #VendorWeek. 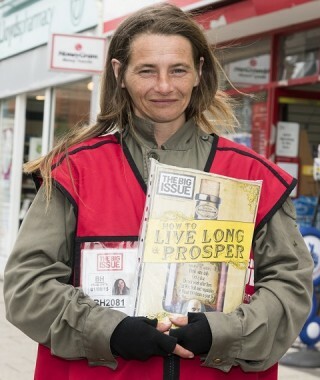 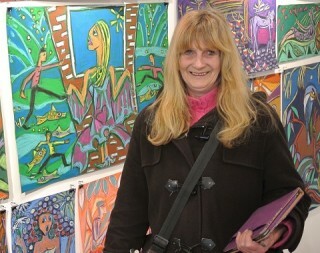 “With the help of The Big Issue I got a flat in Southbourne after being homeless for years,” says Sharon. 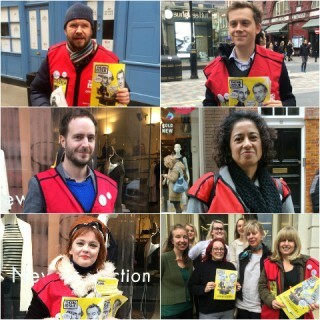 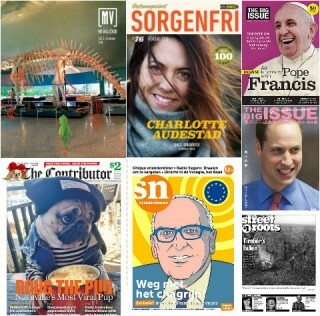 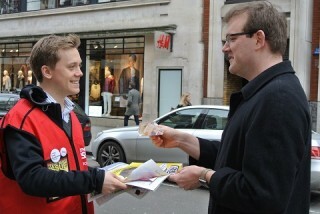 Some of the biggest names in publishing sold The Big Issue on the streets of London yesterday for #VendorWeek. 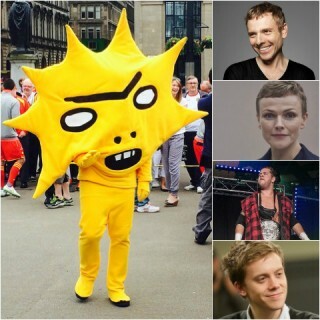 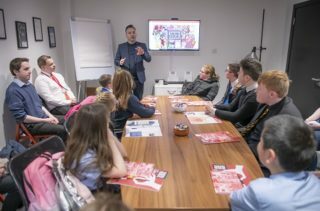 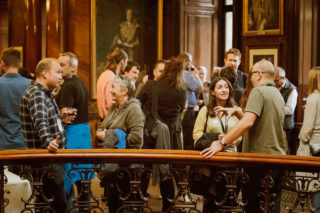 Belle and Sebastian’s Stuart Murdoch, actress Maxine Peake, Guardian columnist Owen Jones, David Shrigley-designed Partick Thistle mascot Kingsley and Scottish professional wrestler Grado will be among #VendorWeek supporters. 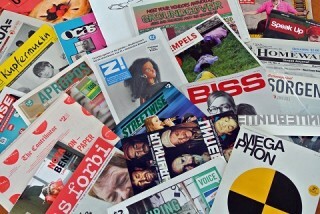 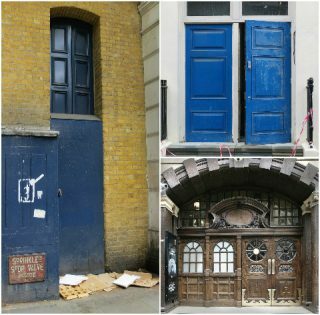 New figures reveal the impact of INSP street papers across the world. 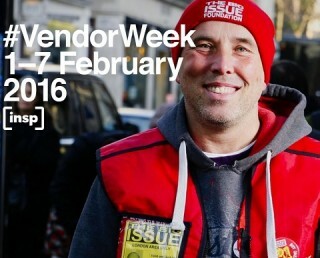 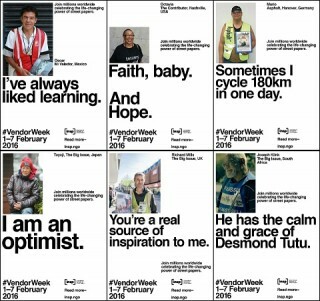 Statistics released for #VendorWeek show 23.5 million street papers were sold last year. 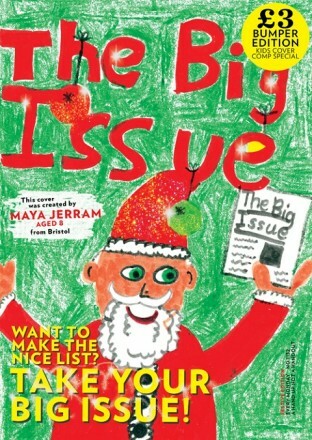 For the third year in a row, The Big Issue has thrown open its Christmas cover design to UK children. 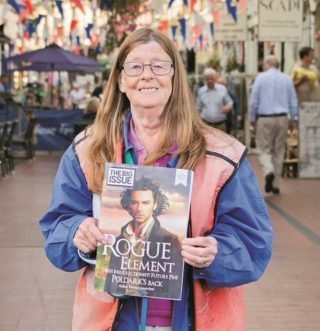 Deputy editor (and chief Christmas elf) Vicky Carroll says the competition spreads the Christmas spirit for staff, customers and vendors. 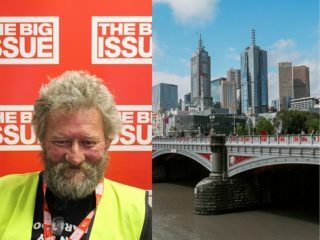 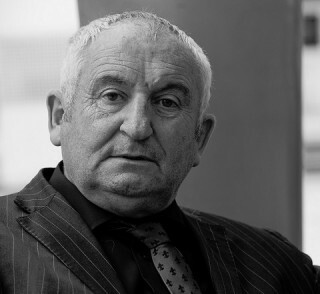 Big Issue founder John Bird has today been appointed to the UK’s House of Lords, the second chamber of the UK Parliament. 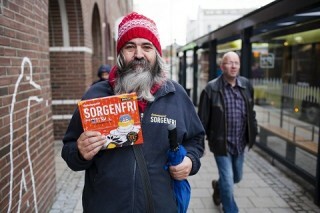 “I’ve been reading Terry Pratchett. 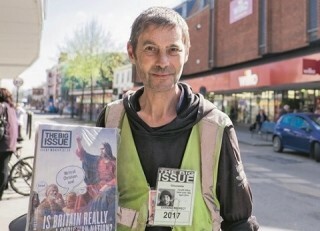 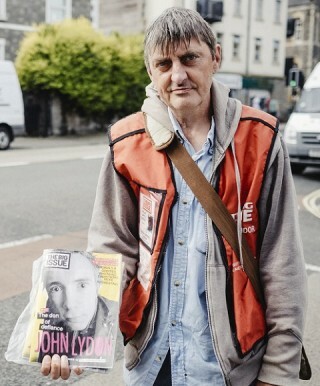 I like the philosophical element,” says Big Issue vendor Craig Newman. 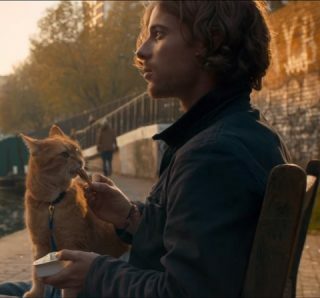 Rising British actor Luke Treadaway is set to play former Big Issue seller James Bowen, whose books about how a stray ginger cat called Bob helped him out of homelessness have sold more than 4 million copies worldwide. 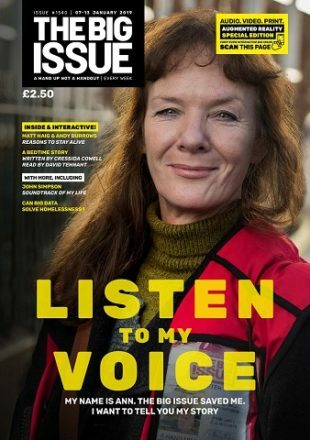 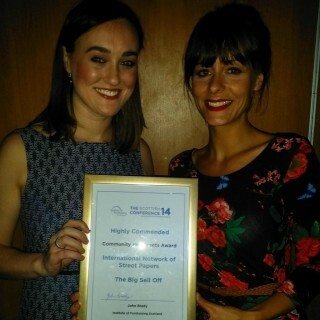 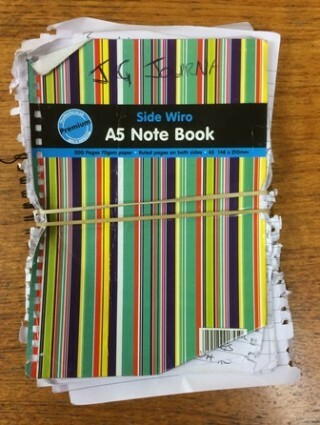 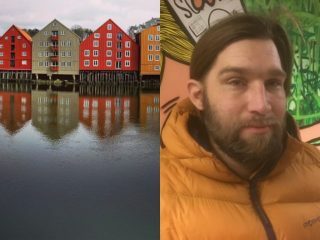 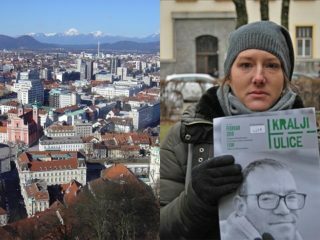 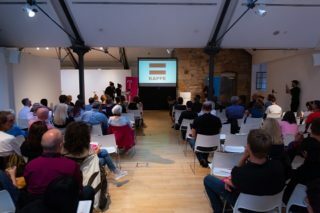 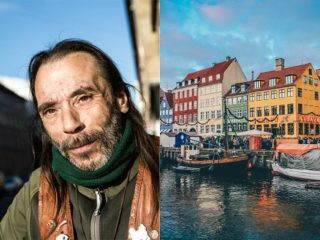 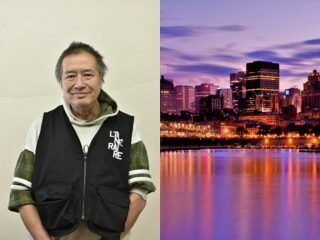 A diary written by a Big Issue vendor about his experiences sleeping rough has attracted a wave of attention and praise from established authors and members of the public.